Most people who have partnered with Homeward’s Director of Research and Evaluation, Margot Ackermann, know that Margot has an incredible ability to translate the conversations we have with people experiencing homelessness into data and information that tells our community how we are doing in our collective efforts to make homelessness rare, brief, and one-time. Margot oversees the Homeward Community Information System (HCIS) and the regional point-in-time counts. These two data sources together provide both cross-sectional data (snapshots of homelessness on a given day) and longitudinal data (trends over time). These data sources provide powerful and compelling information for all of us as we work together to continuously improve our coordinated response to the crisis of homelessness. Full reports can be found here: http://www.homewardva.org/data/trends. At Homeward, we use data which comes from the conversations with people in crisis to guide our planning and support functions for the Greater Richmond Continuum of Care. Margot and Kelly King Horne, Homeward’s Executive Director, have worked together since 2007. Along with the other staff members at Homeward, Margot and Kelly have developed a productive partnership to use data on homelessness in our community to drive decision-making. 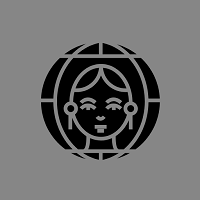 Often, Kelly will ask Margot for insight into a community issue based on available data. In order to gauge whether the question is readily available for analysis or if the request would require complicated data matching and statistical analysis, Kelly will ask Margot if her request is a “5 minute request.” These 5 minute requests typically address specific questions asked by our partners or potential partners about the experiences of subpopulations experiencing homelessness or potential overlaps between homeless services and other systems of care. In 2019, we want to share these insights with all of you. 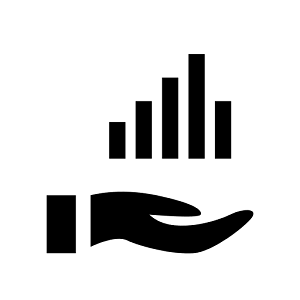 We hope you find our “5 minute requests” useful and invite you to submit suggestions for future data insights to 5minuterequests@homewardva.org. These newsletters will also be archived on the Homeward website at http://homewardva.org/data/5-minute-requests. 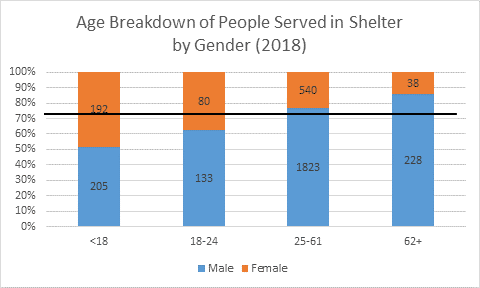 Today is International Women's Day so we wanted to take a look at the distribution of gender across age categories for people who stayed in emergency shelters, transitional housing, and Safe Havens in greater Richmond during 2018. 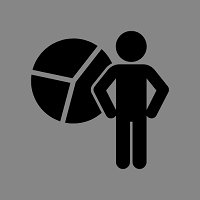 The thick black line here represents that 73.8% of the total population are men, so we would expect to see men below the line and women above – discrepancies show where each gender is over/underrepresented.The chart below shows that children and young women are over-represented in our region's shelter client population. Note: There were 5 people who stayed in shelter that identified as transgender, but were not included in this data due to the small sample size. 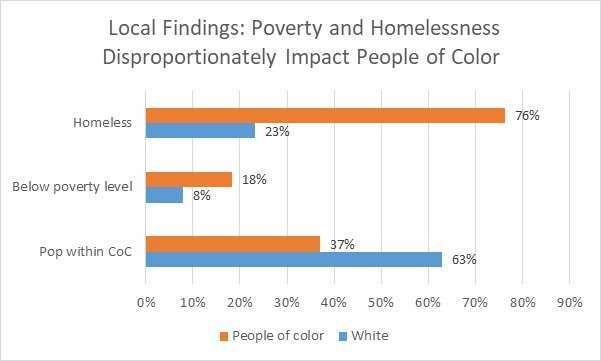 Racial disparities in rates of homelessness are seen nationally, according to the National Alliance to End Homelessness (NAEH). Supporting Partnerships for Anti-Racist Communities (SPARC) examined data from six communities and concluded that these disparities could not be fully attributed to racial differences in poverty rates. This conclusion also holds for the Greater Richmond Continuum of Care- with rates of homelessness among people of color within the general population being 30% higher than would be expected if only poverty were accounted for. 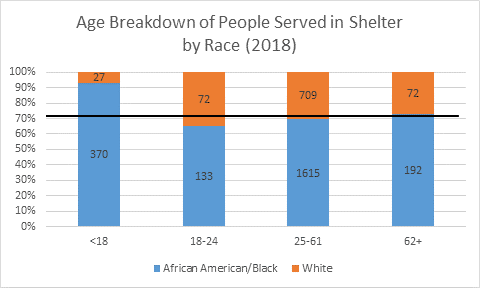 Below is a chart of age breakdowns by race for people who were served in emergency shelter, transitional housing, or Safe Haven in the Richmond region. The data only includes people who identified their primary race as Black or White due to small sample sizes in the other race categories. Among this group in 2018, 72.4% were Black, and 27.6% were White. The thick black line in the chart marks the 72.4% line, and allows us to see racial distribution across the age categories. Note: all people in shelter under 18 years old are accompanied by parent(s)/guardian(s). 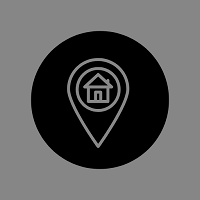 When clients present for homeless services, they are asked the ZIP code of their last permanent address. The map below shows the areas around Richmond that people reported as their last permanent address between July 1, 2017 – June 30, 2018. (Note that all program types are included in these numbers – coordinated access, rapid rehousing, services only, street outreach, emergency shelter, transitional housing, Safe Haven, permanent supportive housing, and other permanent housing.) 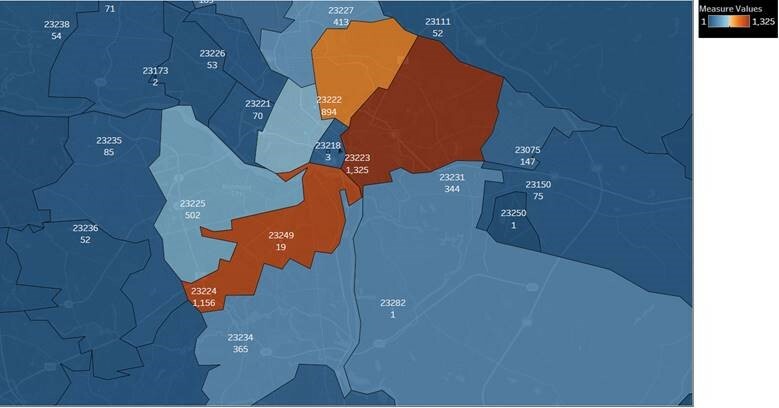 On the map, the ZIP codes appear above the number of people. During the July 2018 Point-in-Time count, we asked a few questions related to evictions. We surveyed 389 adults experiencing homelessness (out of the 491 adults counted; a 79.2% response rate). People were asked what the primary cause of their homelessness was, and 34 people (8.7%) indicated that the reason was eviction. Additionally, those surveyed were asked three questions related to evictions. 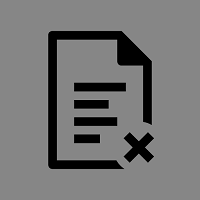 Of those who said they had been kicked out or evicted, a majority (64.4%) indicated that they had received a legal notice specifying a date/time they needed to leave.